This page will give you a starting point for detailing your car. Keep in mind there were variations on the production line and not all cars were the same. I encourage everyone to do their own research and compare it to what you find here. If you are going to show the car in MCA Thoroughbred or SAAC Division 1, painting natural parts may not be appropriate. I encourage you to drive your car and enjoy it the way Carroll Shelby intended it to be... Keep in mind, when the cars were new, many of the suspension components would have been rusty, by the time they hit the show room floors. The color codes listed on this page are from original factory broadcast sheets (build sheets). Coil Springs were painted semi-gloss black. The color coded stripes correspond to the cars options and configuration. In the case of the KR fastbacks, two identical cars could have different color codes, based on their build dates. KR fastbacks started out using the Gold/Gray spring and then switched to the more common Gold/Pink. See the chart at the bottom of the page for the correct color codes for your application. If you are working on a Mustang, the Master Parts Catalog may be of assistance. The Spring Seats are natural in color. You can use a bare steel paint. Original seats have a Ford trademark and a manufacture stamp on the side. These were also bare steel. I have not found any originals that had black paint on them yet. One way to spot an original upper control arm is look for the four rivets holding the upper ball joint. If you have three rivets or bolts, the ball joints have probably been replaced. 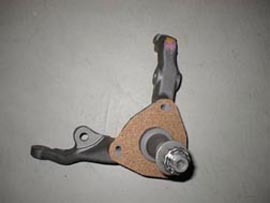 The upper control arm pivot, also natural, usually has a yellow paint daub on it. The spindle is natural. Many people mistakenly believe these are cast iron. They are actually forged steel. Spindles have a very dark finish. 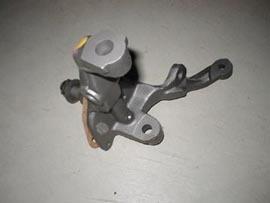 This is a result of the forging process. Look for color codes at the top and on the legs. The spindle should also have the cork gasket. The gasket will keep the disc brake, dust shield from rattling. Contrary to popular belief, I think it is unlikely that the left and right suspension components are always coded green and yellow. Lower Control Arms are also natural. However, most of the arm is dipped in semi-gloss black. This gives the part a very unique appearance. 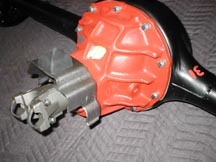 Original arms also have two small brackets on the bottom. Ball joints should be riveted to the arms. Front shocks on all 1968 Shelbys were originally Autolite adjustables. The shock was a dark blue color. These were made by Gabriel. The originals carry a "Z7ZD-18045-A" identification number. 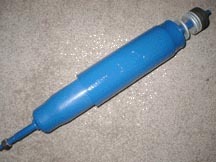 Koni shocks were not used at the factory in 1968. The struts are natural. Actually they were originally phosphated. 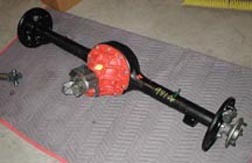 Even though the strut rod is steel, they typically have a dark finish. Leaf Springs were unpainted. Again, I prefer to use the cast iron paint to represent the factory phosphate coating, which is a dark gray. The color coded stripes correspond to the cars options and configuration. 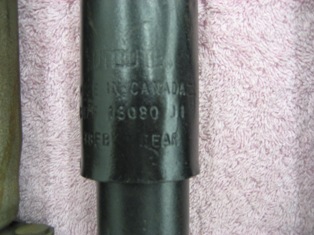 The springs also have an engineering identification stamping. See the chart at the bottom of the page for the correct color codes for your application. I have seen rear springs color coded in different areas. The spring hangers are natural in color. 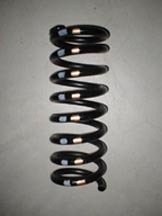 On GT350s, GT500s and KR automatic transmission cars, the rear shocks are Autolite. These were painted blue and carried the ID number "Z7ZD-18080-A". The actual part number is C7ZZ-18080-A. They were made by Gabriel. Build sheets for KR 4spd cars list the code "ORG" for rear shocks. 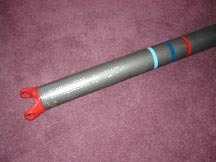 However, these shocks were painted black in color. They carried an orange paint daub. The ID number is C8ZF-18080-J1. 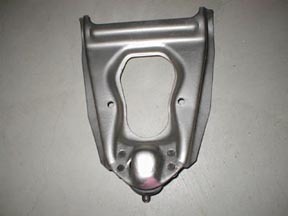 The shock mounting plates are natural in appearance. 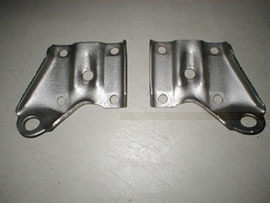 All GT350s and GT500s used these shock mounting plates. The GT500 KR, automatic transmission cars also used these plates. These plates are from a 4spd, GT500 KR. 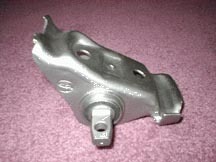 The shock mounting plates on a GT500 KR with a 4speed are different because of the staggered shock arrangement. 1968 GT500 KR, 4spds were the only 1968 Shelbys to use the staggered shocks. 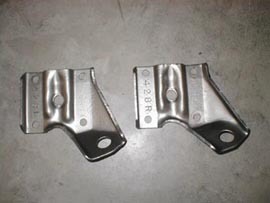 The 4spd plates are stamped "428L" and "428R". Lastly, a correctly striped driveshaft. The driveshaft is bare steel, the yokes may have orange paint daubs on them. This one is striped; light blue, dark blue, red and is correct for GT500 convertible with an automatic transmission. Stripes are about 1/2 inch wide; separated by two inch spaces. 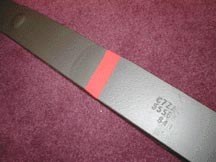 The first stripe is approximately 14 inches back on the shaft. the "concours color coding chart"